With each social outcast comes a bold, eccentric but accepting sidekick. Where Sherlock Holmes had Dr. Watson, Napoleon Dynamite had Pedro Sánchez. The young transfer student from Juarez, Mexico, inspired one of the most famous dance skit scenes in film history, when he ran for Student President in Jared Hess’s 2004 cult classic film, Napoleon Dynamite. 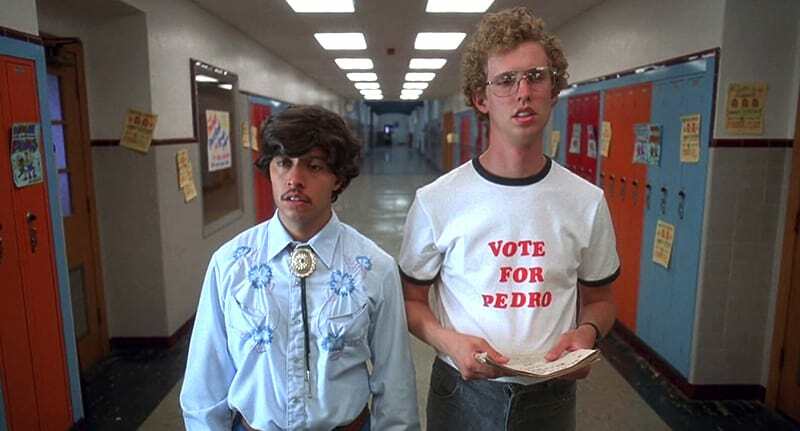 Between fulfilling high-school political ambitions and scouting for babes, Pedro and Napoleon managed to make it through the education system. And once John Heder and Efren Ramírez finished filming, shockingly grew up into actual real life adult men. #edgeofseventeen #VOTEFORPEDRO #efrenramirez #actor #character #theedgeofseventeen #greatfilms what a wonderful film from beginning to end!!!???????? Efren Ramírez, who played Pedro, was 29 years old during the film’s production but thanks to that unavoidable inevitability of life (growing old), the actor is now 43. Since offering his protection to Napoleon Dynamite, Ramírez has starred in Crank, a rare film which is actually comparable to Napoleon Dynamite in its oddity, alongside Jason Statham. He also appeared in Employee Of The Month, Mr. & Mrs. Smith and Nacho Libre. Ramírez is as multi-faceted, talented and gifted with the grace of mass appeal as his counterpart, Pedro. He DJs and has his own music production company called Nocturnal Rampage, as well as co-founding Powerhouse Pictures Entertainment, LLC with Chris Barrett. Together, they co-authored the book Direct Your Own Life: How To Be A Star in Any Field You Choose. It seems Ramirez is still enjoying the spoils of war in Hollywood and the long-lasting appreciation for Napoleon Dynamite with advertising deals courtesy of Burger King. He is starring in a new Crackle original film, set for release early this year, called Mad Families. Ramirez is also going back to school in another feature length, Middle School, where yet again he will proudly display his fine facial hair for all the tween male students to fawn over. This guy will always have my vote.